VOIP Phone Systems for Business | How does it work? Home > Upstream VoIP > Hosted VoIP Information > How does VoIP work? To the user, a VoIP phone works just like a normal phone. The business gets significant cost savings and the IT department get a service that is totally and easily controlled by them. You can call land lines, mobiles, or other VoIP numbers, and all calls within your company become free regardless of geography. If you need one line or one thousand we can have you up and running in no time, there is no minimum contract so if you have a flexible work force you can activate a deactivate lines as you need them. The phone is the only hardware so if your requirements change you are only committed to the month you are in. Wired, Wi-Fi or 3G/4G – whatever works for you. Your calls are turned into data, so they can travel on the same network as, say, your email. One big advantage of this is you won’t have to manage two separate networks, which saves money and gives you flexibility. There are servers spread out geographically to ensure your service will always stay up and running even if there’s a problem at one of our locations. And because it’s all online, upgrading your phone system is done automatically, making it quick, seamless easy – without downtime. You can simply take your handset, plug it into a working connection elsewhere, and your number, contacts and services will come with you, instantly. Swap desks, swap buildings, swap countries – your VoIP phone works wherever you have internet. However, VoIP is flexible so if you prefer you can also run VoIP services from a ‘softphone’, an app running on your smartphone or computer, which can integrate seamlessly with CRM or Office software. 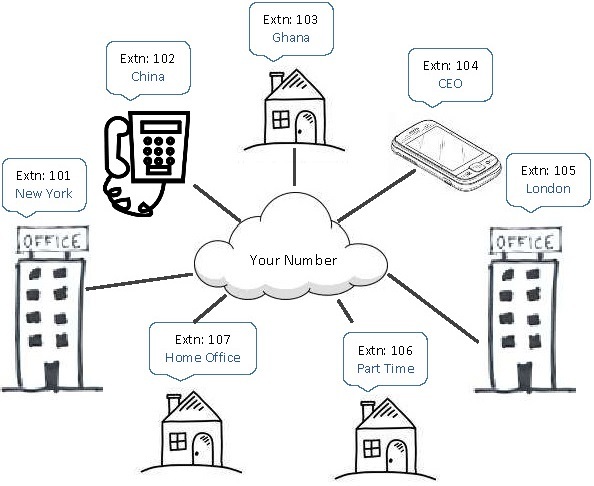 Your phone system is not tied to your location so you’ll be able to add remote and home workers onto your VoIP network, with your company telephone number – with a single virtual switchboard, wherever they are in the world – saving you money that might otherwise have been spent reimbursing their calls. If your business is expanding and you need more lines you can run our service alongside your current one without having to run more lines into your offices and committing to a new contract with your current supplier. Just buy the phones and plug them into the network. Our phones can present you company number when dialing out so your customers and suppliers wont know any difference.